Along Niemenhamen Road, the artsy district of Chiang Mai located near Chiang Mai University, sits a nondescript restaurant with a utilitarian name: Burmese Restaurant. Recommended by a friend who moved to Chiang Mai recently, a recommendation confirmed by several Burmese staff members of the hotel at which we stayed, I went for dinner. 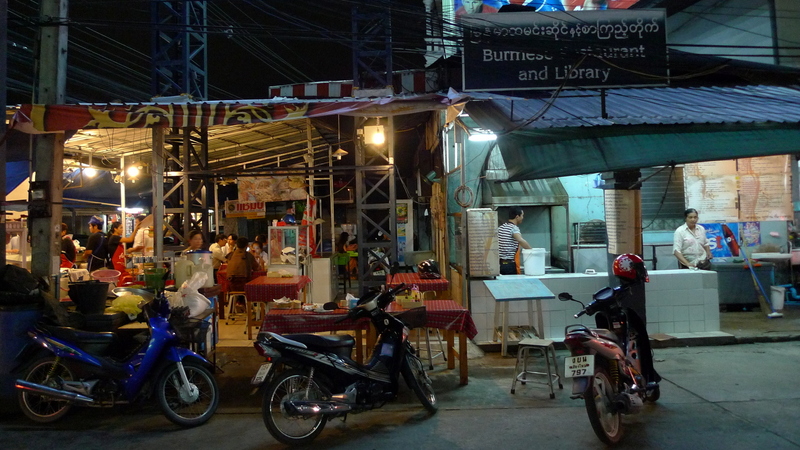 The restaurant sits directly on the street at the corner of Soi 8, the cooking area and one dining area located outdoors, another dining area indoors. The crowd of diners was very light this Friday evening, maybe due to the impending rain. The friendly staff welcomed us and offered us a table indoors, turning on fans to ensure our comfort. There are two menus, each a single page with about thirty items. One menu features Burmese dishes. 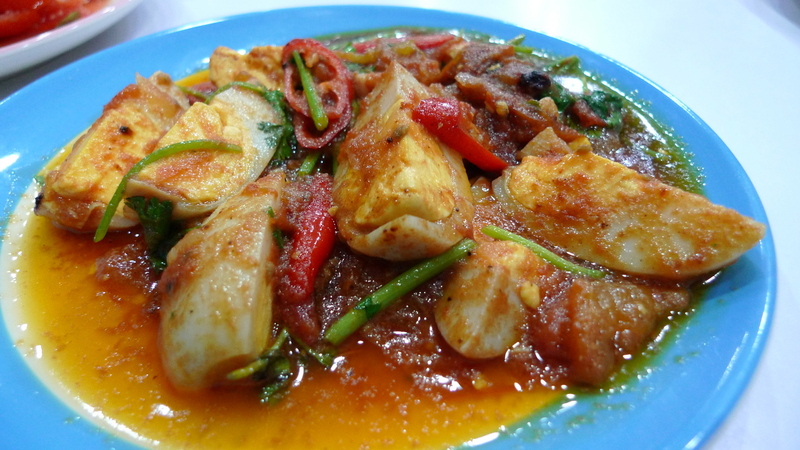 The other menu features Thai/Chinese style dishes. We ordered from the Burmese menu with the exception of one vegetable dish. Unfortunately, several items we ordered were not available either because they were out already or the dish is not offered every day. Here is a look at the dishes we ate – all of which were tasty. The entire bill for five diners was less than US$20. Needless to say, I’ll be back next time I am in Chiang Mai. We had ordered a curried fish soup that is the national dish of Burma. Sadly, it was not on the menu so we instead ordered this bean soup, which was tasty although not very distinctive. The goat curry, which our local friend enthused about, was also not available that day so we chose the chicken and potato curry instead. While it may not look particularly attractive, especially because of the oil slick on top, the curry was very flavorful and we ordered a second serving. The stand-out dish was this tamarind leaf salad, one of several salads on the menu made with what I would consider “unusual” ingredients. This salad was refreshing and it is difficult to describe the flavor of the leaves. The flavor is entirely pleasant and entirely unlike the taste of the tamarind fruit. One blogger described it as “eating al dente ferns”, which is about right. The salad is sweet and sour and salty with chopped peanuts and tomatoes. We also ordered a tomato salad, which was a pleasant surprise. 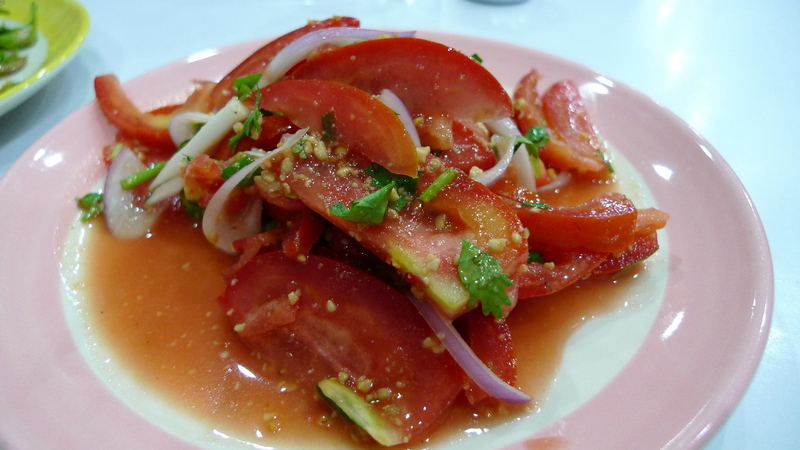 With the exception of cherry tomatoes, which are generally very red and sweet, tomatoes in Thailand are usually pale pink and crunchy. These were anything but, and with onions and cilantro, they made for a refreshing dish. The menu contained many items translated into English as “curries” that are different from what you might expect, especially if you consider a curry as something with coconut milk in it. Instead, these curries feature a variety of spices but lighter sauces. The above picture is of an eggplant curry dish that was very nice. There was also a boiled duck egg curry dish that was tasty. 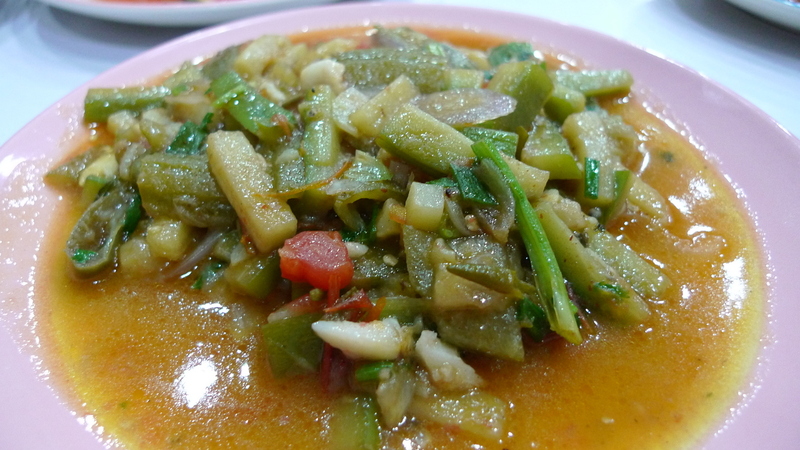 While you see a lot of chilies in this (and other) dishes, they were not particularly spicy at least by the standards of Thai cuisine. As one Burmese friend described it, the food is more similar to Northern Thai cuisine than the super-spicy Northeastern or Southern Thai cuisines. 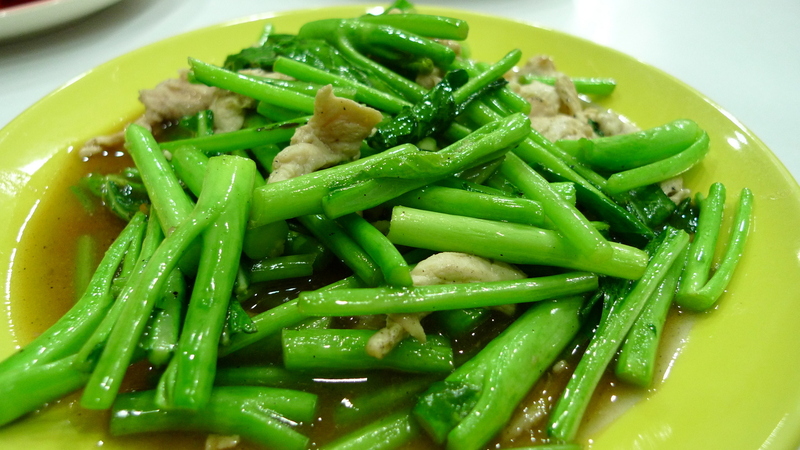 The only item we ordered off the secondary menu was this simple stir-fry of greens and pork. While the salads we ordered had lots of greens, it felt like another dish of vegetables would help balance things out. This is probably only the third or fourth time I have eaten Burmese food, and the first time in more than a dozen years. Without a doubt, I need to seek it out more often! This entry was posted in Food and tagged Burma, Burmese, Burmese Cuisine, Burmese Food, Chiang Mai, cuisine, Dining, food, Myanmar, Niemenhamen, Niemenhamen Road, Restaurant, Thailand by christao408. Bookmark the permalink. Looks and sounds delicious. I have been experimenting with all different kinds of foods the last few years and have found there are very few I don’t care for. BTW, thanks for making it possible for me to be here. Hi there – you are welcome. Glad you enjoyed the entry. Oops….Forgot to say that I had made a spot called Char’s Chattering – cjc22 – on word press, but I mostly write on my cjc2xanga site. Have no idea how to tell folks to get to that one, but wanted you to know it was there. The colors of the dishes are really great. I had heard that Burmese food is very oily and your pictures confirm that. You know, I wonder if it really is any more oily than other types of food, or just less emulsified? It didn’t feel oily or heavy at all. Right, maybe not oilier than a lot other SE Asian dishes. True. Or buttery mashed potatoes. 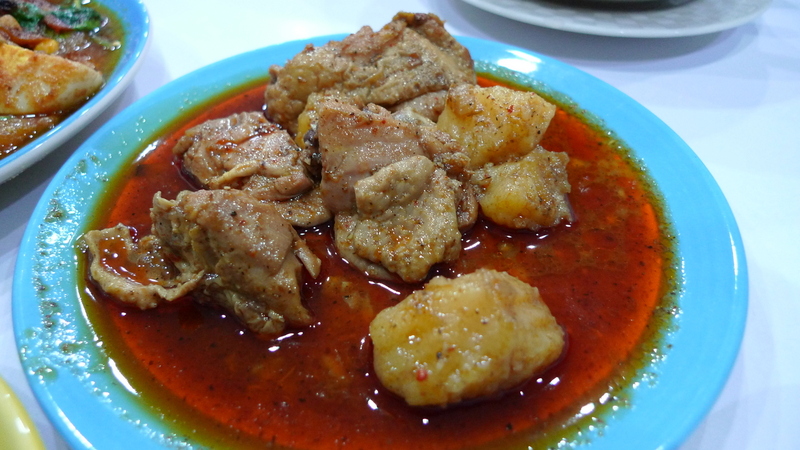 Burmese dishes are not very different from Indian dishes. The curries and the vegetables are so alike, and the taste is similar. I am so glad that you are enjoying these wonderful and palatable authentic dishes. The main meat I cook with is Goat. It is so healthy and wonderful to taste. Chris, as a child I used to eat the tamarind leaves (the tender green leaves) right off the tree in our yard. I had forgotten all about that until just now. Great post, as always. Hi Dr. Z – glad you liked the post and thanks for sharing your childhood memories. I’ll have to take a closer look at the tamarind trees in our neighborhood. Have never actually looked at the leaves’ shape. 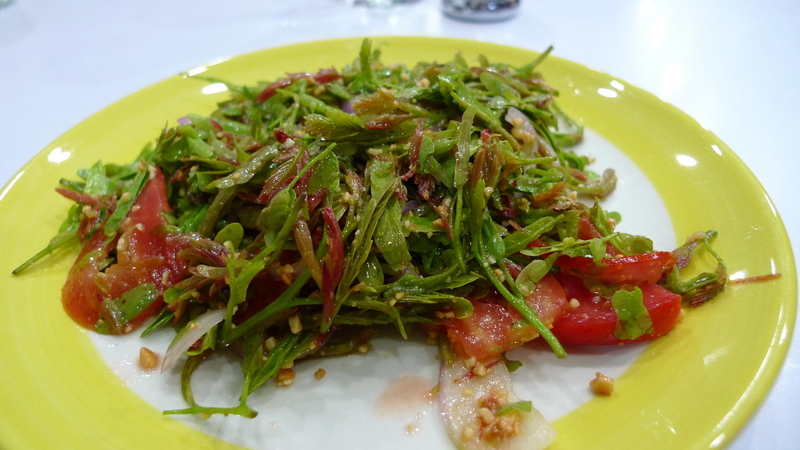 The tamarind leaf salad, tomato salad, and stir fry greens looks totally yummy to me. Sounds like a comfortable and friendly place to sit and enjoy a meal. Have a good rest of the week end and a wonderful week. Thanks for the kind words and glad you enjoyed the post! So happy that you enjoyed Burmese food although it’s unfortunate that so many things were not available. I would have loved to know what you think of the “national dish” which I assume is Mohinga noodle soup(?). This leaves me with such a craving for Burmese food; especially that tamarind leave salad. Yum yum! 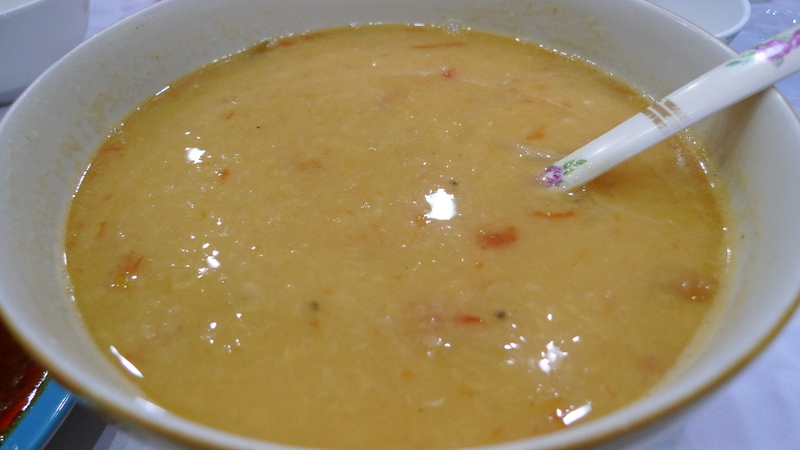 As it was explained to me, I understand the national dish to be a curried fish soup. But my understanding may be wrong. I am looking forward to my next taste of Burmese food, though. We are probably referring to the same dish: rice vermicelli noodles in curried fish based broth. I recall that flower show; it ran for a few years, I think. Actually, I think that some Burmese food looks oily because they also made use of water in the cooking, and thus, it looks like there’s a lot of oil in there. But yes, some do use a lot of oil in the curries. Well, next time, right? Or when I go to Burma for a first-hand foodie tour.